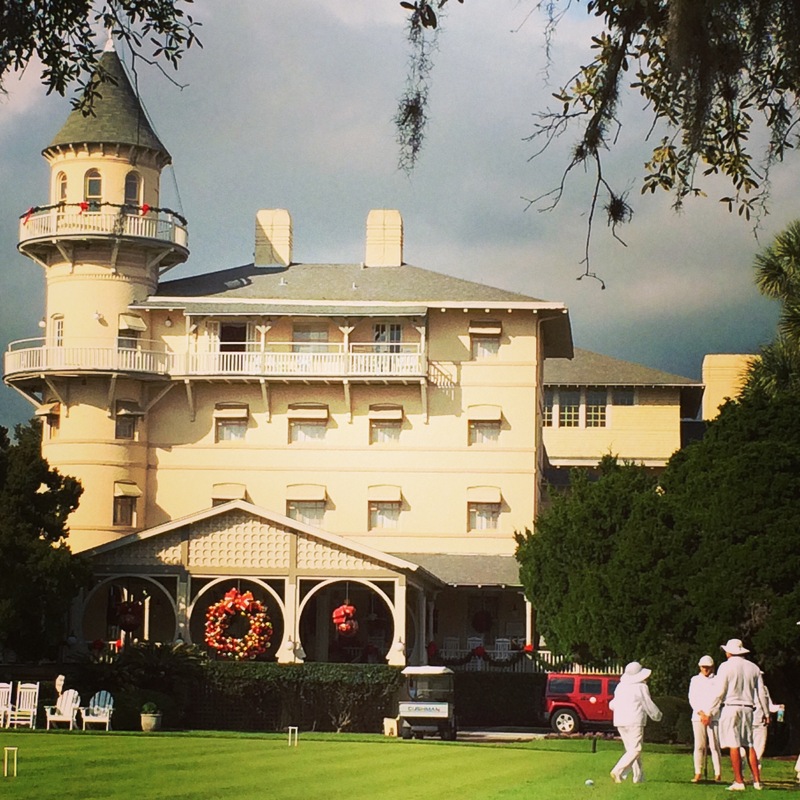 Coasting: That “old money” feel of Jekyll Island | Oh, the Places We See . 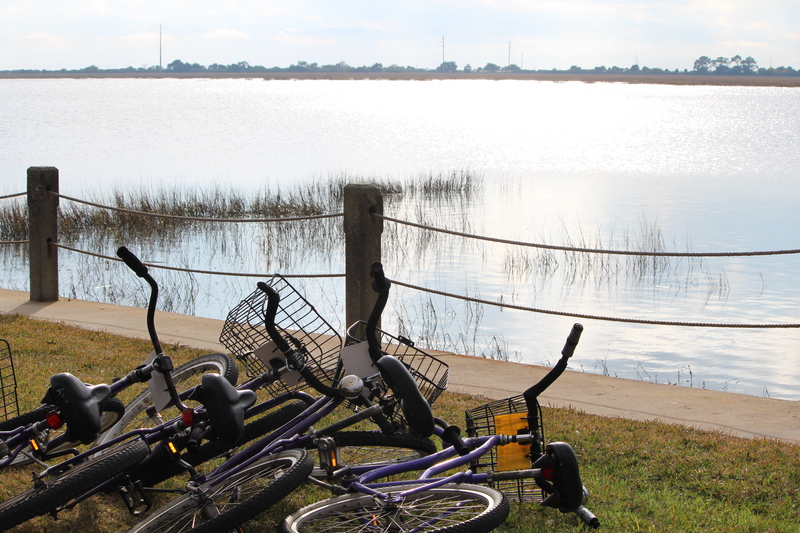 . .
Our Coasting series continues with a short one-day trip to Jekyll Island, one of four barrier islands in Georgia. Although Jekyll can boast of lovely marshes, moss-draped live oaks, and quiet beaches, it was the historically lavish lifestyle of the rich and famous that drew us to the historic district where several of the buildings of the Jekyll Island Club still stand. 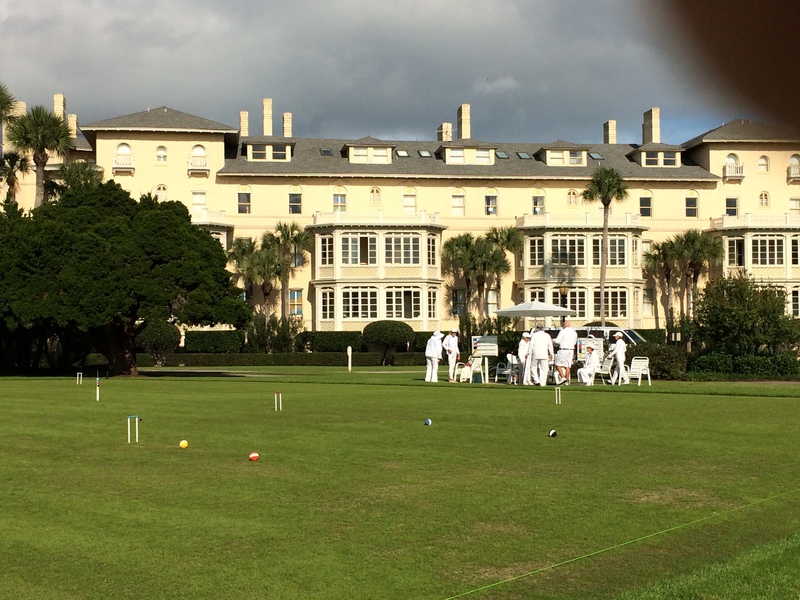 One wing of the Jekyll Island Club facing the croquet lawn. It was Newton Finney (served briefly as captain of engineers on Robert E. Lee’s staff during the Civil War) and his brother-in-law, John Eugene DuBignon, who dreamed of developing a hunt club for wealthy northerners. Between 1879 and 1885, the men acquired the land and convinced investors to create the exclusive Jekyll Island Club. Finney and DuBignon then sold the newly incorporated club to the 53 member investors among whom were “Men of Means” (as the plaque on the grounds dubbed them) such as J. P. Morgan, Joseph Pulitzer, William K. Vanderbilt, Henry Hyde, and Marshall Field. The iconic turret of the Jekyll Island Club. 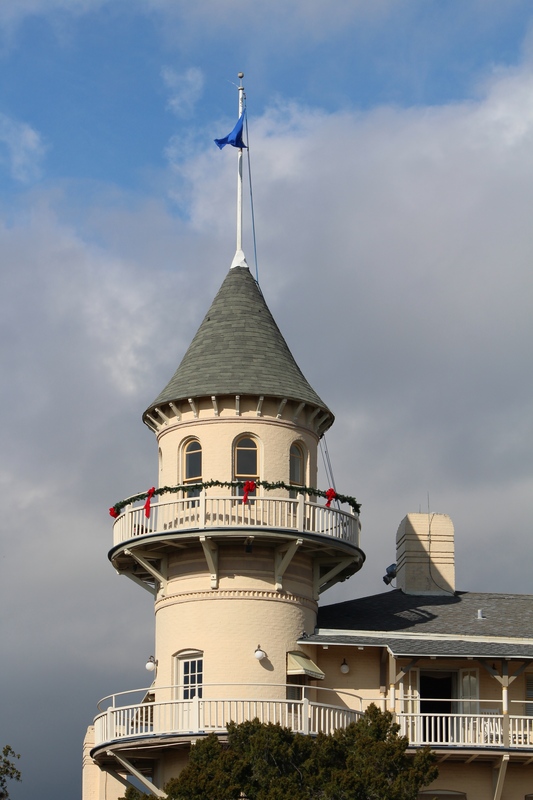 Officially opened in 1888, the Queen Anne style Clubhouse, designed by Charles Alexander of Chicago, was hailed for its notable details — a signature turret, bay windows, leaded art glass, and sizable rooms with tall ceilings. Club members and their families engaged in leisure activities that even today sound sumptuous — yachting, hunting, lawn parties, carriage rides, and formal dining in the evenings. 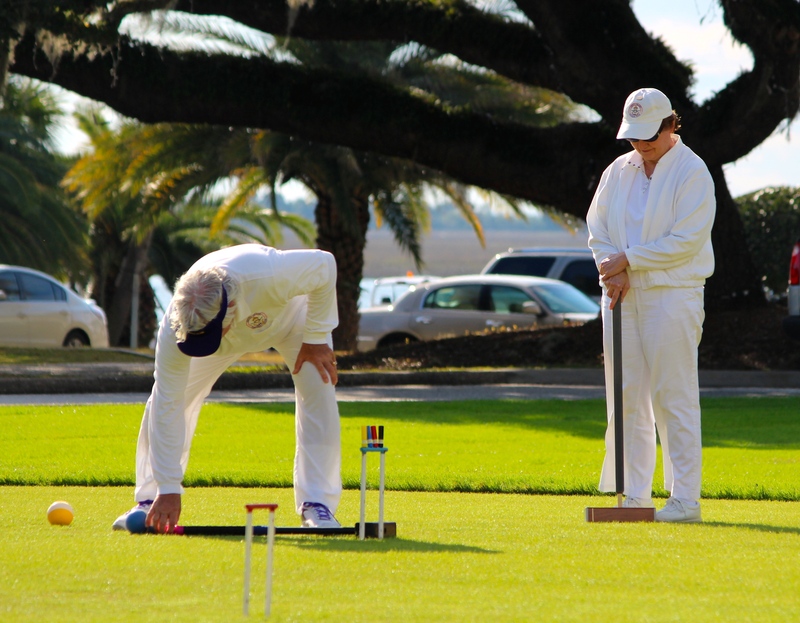 And yes, we were there on a day when white-clad players of croquet took to the front lawn much as we imagine the club members might have done. Ah, the good ol’ days! Other cottages are open only for tours. Like Indian Mound Cottage, home of William and Almira Rockefeller, built in the early 1900s, subject of this video posted on YouTube. It’s a good idea to take a trolley ride complete with talkative driver elaborating on the history, architecture, and social life. Or just sit back and relax to the clop-clop of horses’ hooves as you tour by horse-drawn carriage. 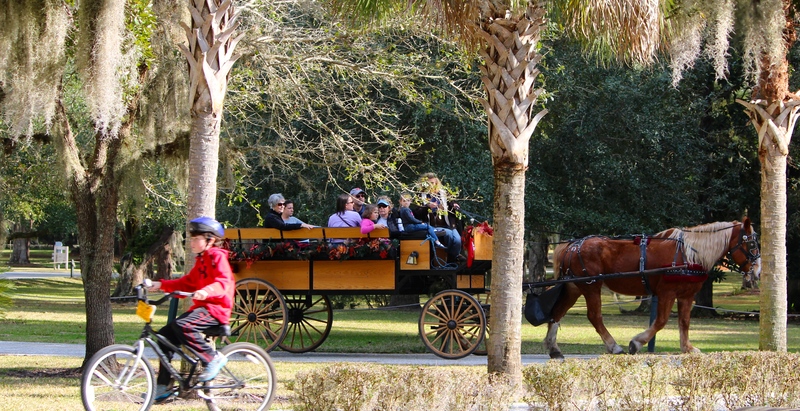 Touring Jekyll by horse-drawn carriage. And, if you’re wondering, you can (YES!!!) be a guest yourself at the elegant Jekyll Island Club where the interior is as interesting and luxurious as the exterior. 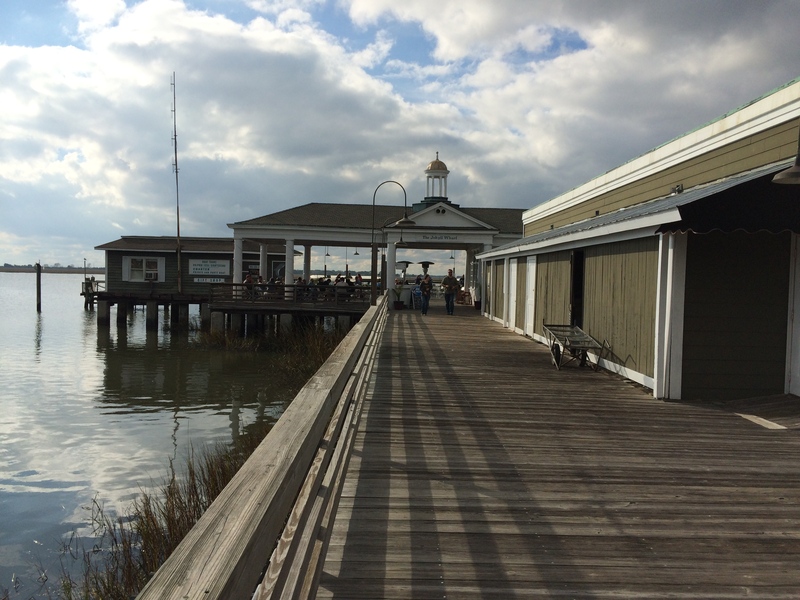 We sauntered out to the Jekyll Island Wharf for a leisure lunch and watched sea birds fly by, all the while pretending that we could be one of the Astors or Rockefellers or Morgans enjoying a picnic beside the sea. Pulling away from the lap of luxury wasn’t easy, but we were interested in what else the island had to offer. A lot, as it turned out. Like Horton House Historic Site located on North Riverview Drive. 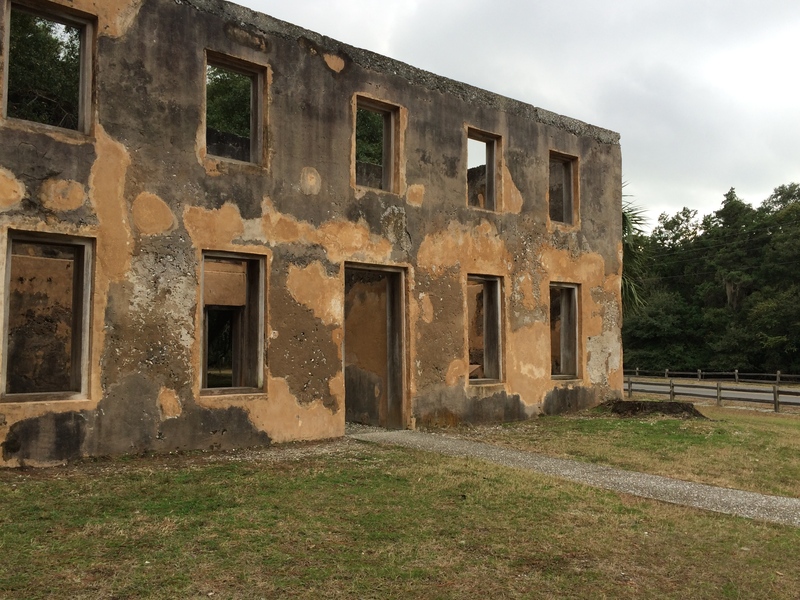 Needing a residence for his family still residing in England in the 1730s, Major William Horton (who served as second in command of General James Oglethorpe’s regiment) cleared a tract of land and built the sturdy structure now known as Horton House. What remains of Horton House, built by Major William Horton around 1740. 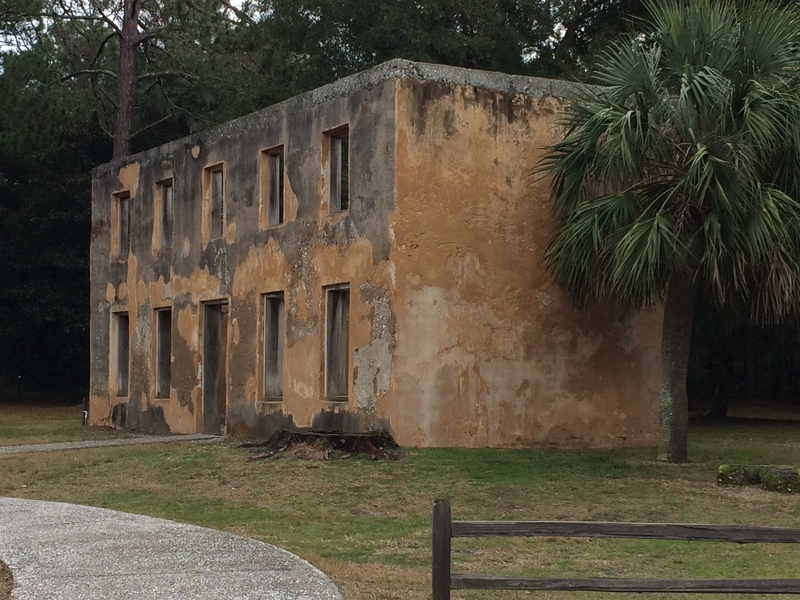 Horton House was built of tabby, a building material introduced to us during our tour of Fort Frederica. Tabby is created by mixing water, lime, sand, and oyster shells. But Horton had to first burn oyster shells to create lime, then mix the tabby, and finally pour it all into the forms that still remain today. The house has been burned, rebuilt, and abandoned, but is now preserved as a designated historic site, open daily to the public. 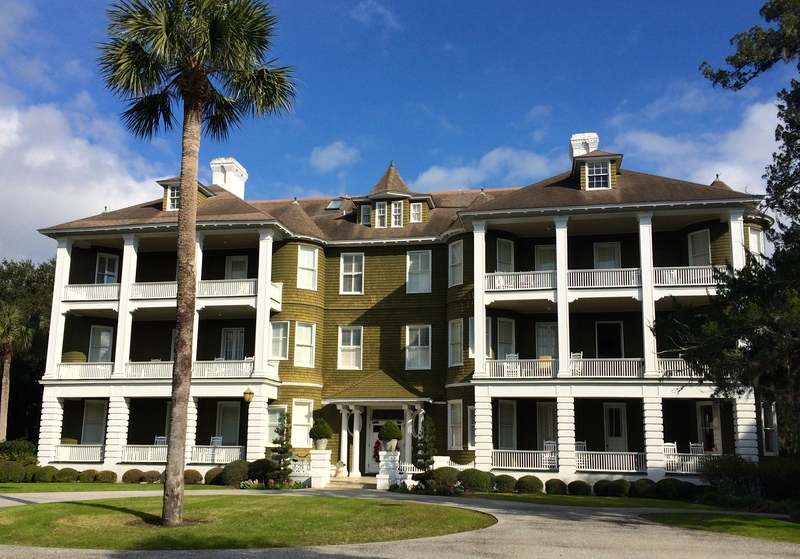 No matter what you choose to do on Jekyll Island — from looking at historic markers to roaming the beaches to pretending you, too, are a descendant of the Astors or Vanderbilts — you can’t escape the elegance and history of an “old money” world gone by. No more cycling. We’re at the beach! 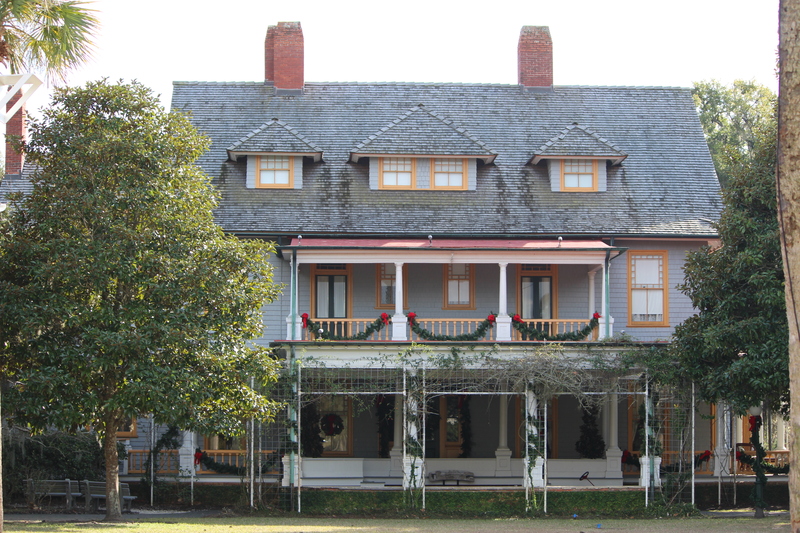 This entry was posted in Coasting, Georgia and tagged Charles Alexander, ExploreGeorgia, Georgia, Henry Hyde, Horton House, Indian Mound Cottage, Jekyl Island, Jekyll Island Club, Newton Finney. Bookmark the permalink. Nice post! It reminded me of a recent trip we made to Newport, Rhode Island, which is also a coastal town with lovely mansions. The Vanderbilts built a mansion there as well. And for a minute I thought the sport you were referring to in the fourth picture is cricket, but turns out croquet is a different game altogether. We’ve actually been to Newport but not for an extended period of time. Would love to return and tour as many houses as they would let me into! OMG! So very lovely — the area and the homes! Thanks for taking a look! You’re right. We do get some pretty terrific views, but it’s mostly one or two nights at a time. I wonder how it would be to have a second or third home complete with help. But I don’t wonder too long. We love traveling and spending snippets of time in various places. It’s a patchwork life, but a rich one! Thanks for reading! That’s how Peggy and I felt during our four years on the road. Thanks, Amy. Wouldn’t it be fun to stay in that lodge? 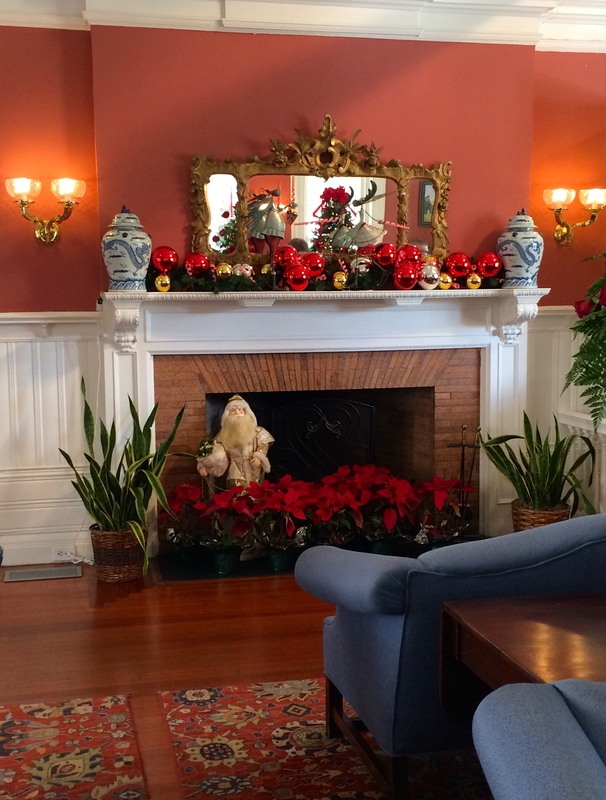 We thought about it while walking around and seeing all the relaxed people in rocking chairs, in the dining room, etc. Ah, the good life!!! Thanks so much. Glad you enjoyed the pictures and the blog. Cindy, I haven’t read the book nor seen Cumberland Island, although I would love to do both. I believe you have to take a ferry over to Cumberland, but pictures I’ve seen on the Internet look great — mansions, first African Baptist Church, etc. Hope you get to go and take great pictures. May have to live through your visit!